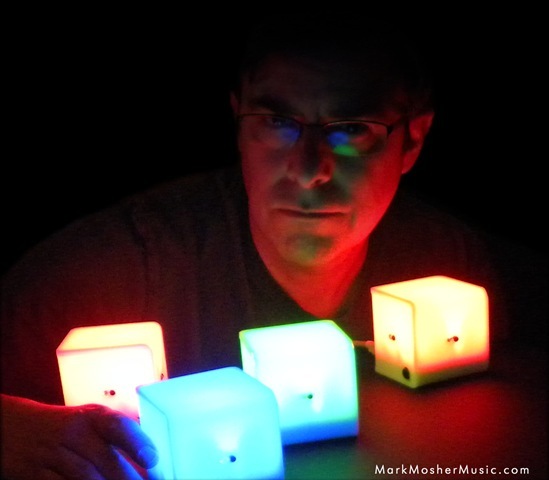 I recently added Percussa AudioCubes to my studio and performance rig. While I’m planning a longer post offering an overview of how AudioCubes work, this is a quick post to mention two applications of AudioCube technology I’ve been experimenting with. First, I’m using them as lights. You can send RGB values to the cubes via MIDI. In the picture above, you can see a color fade being sent to an AudioCube via an Ableton MIDI clip. In a nutshell, you can sequence cubes as multi-color light sources against a timeline. Controller number 14 is used for Red, 15 for Green and 16 for Blue. 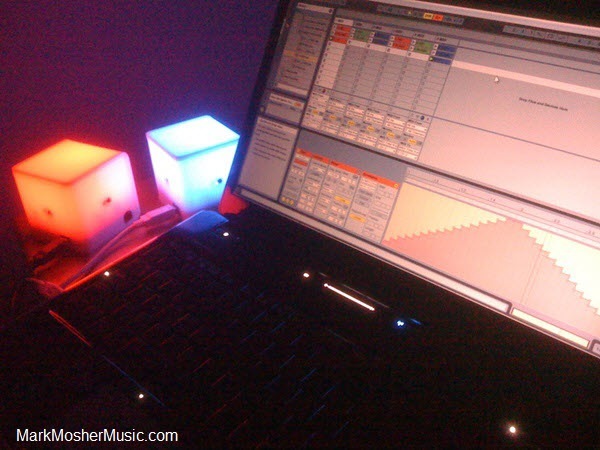 Second, I’ve been experimenting with using AudioCubes+Ableton Live +VSTs to create "performance instruments” that I can play via cubes. In the picture above (click to enlarge), , I’m using Camel Audio Alchemy as a MIDI device with Ableton Live 8. The picture shows crop of a free Percussa app called MIDIBridge which is used to configure the cube settings. I’m using MIDI Yoke ports (I’m on Vista-32) between MIDIBridge and Ableton Live. I am mapping device parameters to the X/Y of the remix pad in Alchemy. I then MIDI map faces of a an AucioCube in “sensor” mode to the performance parameters. In sensor mode, the AudioCube detects the proximity of my hands to their sides of the cube face and sends out a continuous controller value based on my hand position. So one face controls X, another Y. 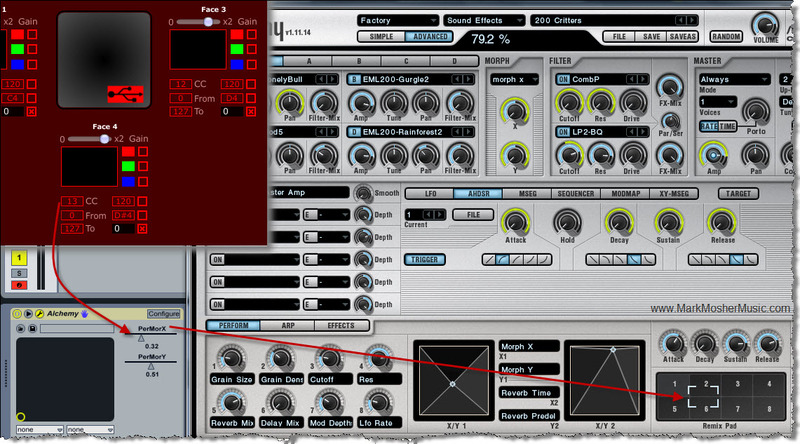 The same idea would work with Native Instruments KORE2. Result = radical sonic changes within Camel Audio Alchmy presets with real time control via an AudioCube. Mid 2010, earlier of possible. Lots of work to be done to create a “show” of some sort. I’ll also continue doing some presentations on music tech for events like Ableton Denver Meetup in 2010. This is a great way to test configurations before you perform with them by the way. Very interesting stuff… when are you going to start playing live? 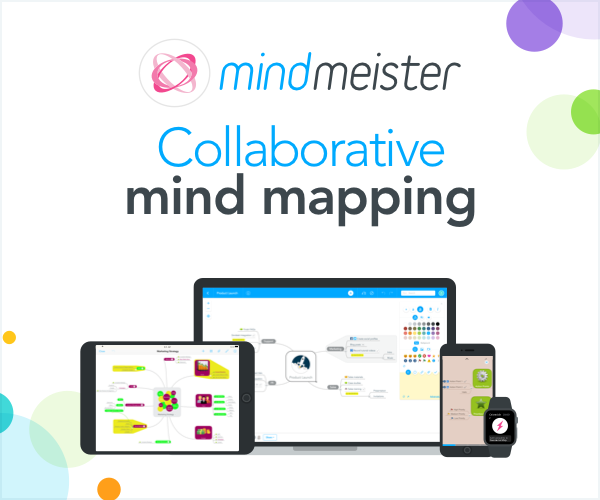 Looking forward to hearing more about how you use them.